New details into the Stratolaunch system have revealed an exciting pairing of a huge carrier aircraft and a highly capable Orbital rocket nicknamed Pegasus II. 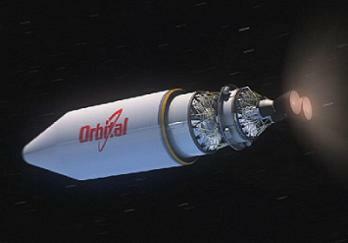 The “Any Time, Any Orbit” air-launch system will be capable of lofting payloads up to 13,500 lbs to Low Earth Orbit. Stratolaunch was founded by inventor, investor and philanthropist Paul G. Allen and Scaled Composites founder Burt Rutan. They announced their plans to the media at the end of 2011, showing images of a super large derivative of SpaceShipTwo’s carrier aircraft that would transport a multi-stage booster to be air-launched, prior to lofting payloads into orbit. 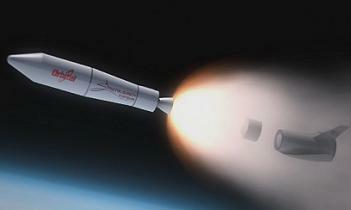 The company originally envisioned the use of a derivative of SpaceX’s Falcon rocket. However, not long into the evaluations, both Stratolaunch and SpaceX decided a four or five engine version of the Falcon would require extensive alterations to its design – something the Californian company claimed would cause too much disruption to their assembly line at Hawthorne. Stratolaunch then approached Orbital Sciences of Dulles, Virginia – not only an established space industry leader, but also experts in air launch, as proven via the 41 flights of their Pegasus rocket, as well as nine other Pegasus-class air launches. Pegasus – a vehicle with three solid motor stages, plus an optional HAPS (Hydrazine Auxiliary Propulsion Stage) monopropellant liquid fourth stage – came into existence in the late 1980s, while a stretched and more powerful Pegasus-XL first flew in June 1994. 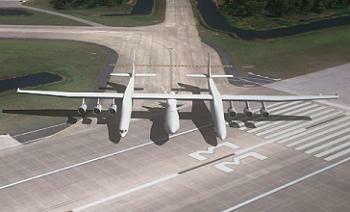 For Stratolaunch, Orbital will be making the next leap forward, with a rocket that is unofficially being called Pegasus II. 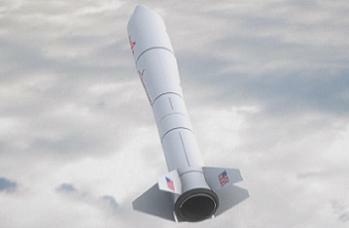 Utilizing the ability to air-launch from an aircraft means that the rocket – which because of the lower outside pressure at ignition can sport bigger nozzles on its first stage solid motor to gain specific impulse – does not need to travel through as much of the Earth’s atmosphere before reaching space, and also allows a greater flexibility in terms of launch sites and orbital inclinations. 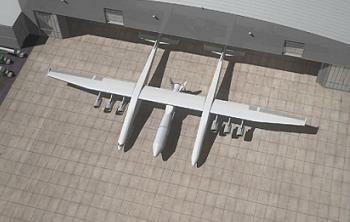 However, designing an aircraft capable of carrying a rocket as large as that envisioned by Stratolaunch is a major challenge. 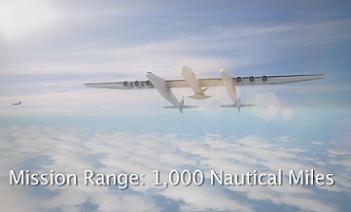 With Rutan’s expertise in aircraft design, which has already resulted in the impressive WhiteKnightTwo carrying Virgin Galactic’s SpaceShipTwo on its first test flights, Stratolaunch’s carrier aircraft is portrayed as having a wingspan of 385 feet, making it the largest airplane, by wingspan, to ever fly. The aircraft will be powered by six 46,000-66,500 lbf thrust-range jet engines, that are planned to be sourced from two used 747-400s that have already been purchased. These planes will be cannibalized not just for their engines, but also the avionics, flight deck, landing gear and other proven systems that can be recycled to cut development costs. As shown in an impressive full mission video, acquired by L2, the huge aircraft would depart from its giant hanger, before taxiing on to a runway that would have to be at least 200 feet wide to cater for the massive plane. A runway such as the Shuttle Landing Facility (SLF) at the Kennedy Space Center (KSC) would more than cater for Stratolaunch, with its 300 feet wide, 15,000 feet long strip, and this has been classed as a potential East Coast location for their missions. However, the focus will initially be to the west, with Stratolaunch systems already signed up to a 20-year lease agreement with the Kern County Airport Authority, Mojave, California, for the lease of 20 acres at the Mojave Air and Space Port. 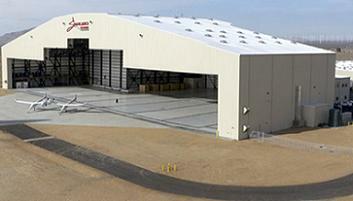 Stratolaunch have constructed a large fabrication hangar and an assembly and test hangar near Scaled Composites. The first of two manufacturing buildings, the “88,000 square foot facility (to) be used to construct the composite sections of the wing and fuselage sections” was opened for production in October 2012, two months ahead of schedule and on budget. Stratolaunch completed their second Mojave building, the very large hangar facility for the Stratolaunch Carrier Aircraft in February of this year. During missions, the huge aircraft will begin its flight by powering up its six 747 engines to enable the aircraft and rocket – weighing in at a combined weight of 1.3 million pounds – to take off. Flexibility is the name of the game for air-launch, although some parameters have already been evaluated, per associated L2 information. This includes information on the amount of time required to fly to the drop point, based on weather conditions. The operational radius for missions will be around 1,000 miles. However, that is based on the carrier aircraft flying 1,000 miles to the drop zone, loitering for an hour, then flying back 1,000 miles – even with the rocket still attached if the mission is scrubbed – then wait for 45 minutes before landing if required. That equivalent range of about 2,500 miles could be utilized when ferrying a rocket cross country. The carrier plane will launch with a crew of three – a pilot, co-pilot and flight engineer – who will have safety responsibilities for the rocket. The complex launch sequence will be performed from the ground via a two-way telemetry/command link. Exclusive details (L2) into the current design work for this new launch vehicle portray a very high-performance rocket, with a GLOW of 485,000 lbs resulting in a payload capability to Low Earth Orbit of 13,500 lbs. Orbital will also be responsible for integration of rocket and aircraft – a system that is being fully financed by Stratolaunch. The first and second stages are made from “carbon-composite wound” cases, with the same outside diameter as the Shuttle Solid Rocket Booster (SRB) segments. As such, these stages will use the same ground support equipment, transportation railroad cars, and lift devices as those used during the Shuttle era. However, unlike the SRBs, Pegasus II’s casings will be much lighter, while the stages will sport additional performance via an updated propellant mix. As seen with Pegasus launches, the rocket will be released over the drop zone, with the first stage solid igniting seconds later to send the rocket forward and upwards as it begins its climb. The rocket will be guided by moving aero surfaces on both its wings and via the two inverted-V tails. The wing will be located on the top of the first stage, while the inverted-V tails share a commonality with Pegasus, albeit at a different angle, so as not to be blanketed by the wings during high angles of attack. The rocket will also have a Thrust Vector Control (TVC) system on both the first and second stages – unlike Pegasus, which does not have a TVC on its first stage. The first two stages will act like a single first stage, given they will provide half of the required Delta-v. The rocket will sport a five meter fairing, which provides a significant percent of the lift during pull-up. Once the solid stages have been expended, a restartable cryogenic third stage will provide the rest of the Delta-v to orbit, as well as allowing for restart capability to achieve higher orbits. This upper stage has been baselined with two Pratt & Whitney Rocketdyne (PWR) RL-10 engines for the development and early flights of the rocket, pending development of a higher thrust LOX-Hydrogen unit. Initially there will be no on-board replenishment for this cryogenic stage during the trip to the drop zone. 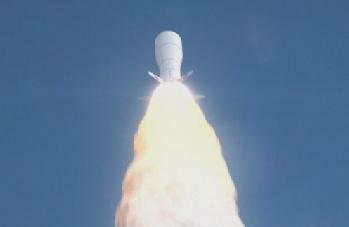 However, one of the “planned product improvements” in work is to enable in-flight top-off of cryos. For Geostationary Transfer Orbit (GTO) missions, the rocket will have a capability of around 4,500 lbs to a 15-degree inclination. This version would use a single RL-10 upper stage and a four meter fairing. Other notes of interest include a GPS-based autonomous Flight Termination System (FTS) that will be certified on another launch vehicle before the first Strato flight. Such a system would minimize, and maybe eliminate, the need to have existing range involvement. However, one intriguing element of the Stratolaunch vision is the potential for their capability to mature into a human rated launcher. The company noted this aim during their initial reveal to the media, and these evaluations are continuing. While the human rating effort was only classed as a very preliminary concept, Pegasus II would be able to grow into such a role. Information states that a future manned winged vehicle would replace the fairing and have an equivalent lift, which is classed as the reason the main wing appears small and located on the aft of the vehicle. No definitive schedule has yet been produced for Stratolaunch, although it is hoped the carrier plane may be ready in time for a 2017 test flight. 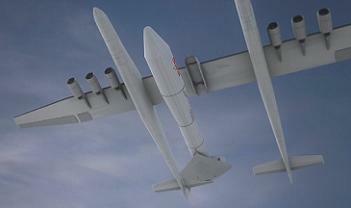 (Images: via Orbital, Stratolaunch, via L2). (Click here: http://www.nasaspaceflight.com/l2/ – to view how you can support NSF’s hosting costs and access over 5,500 gbs of content available on no other site).